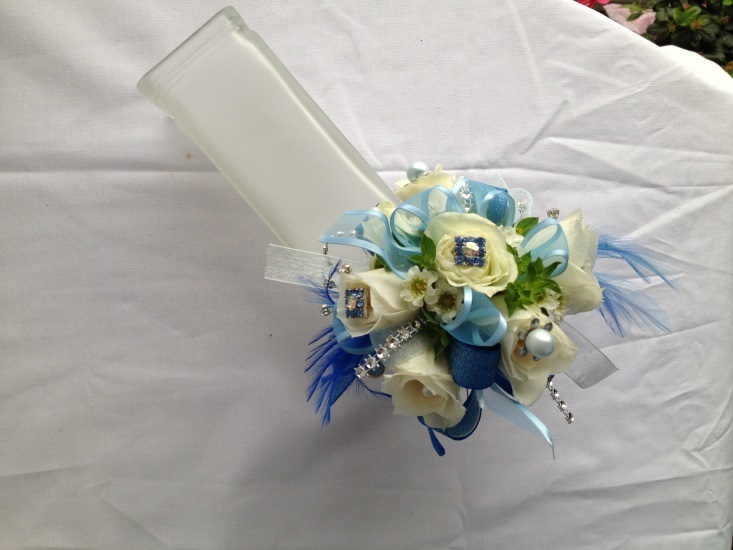 Prom Flowers: Unique challenges-what to design when every request is the same and every item needs to be different. Unique challenges-what to design when every request is the same and every item needs to be different. Every year has its favorite colors. Last year it was royal blue, this year it’s been dark purple and turquoise. When order after order comes in requesting the same color pallet, it can be a challenge to make each boutonniere and corsage unique. purple is just a wonderful color to work with. DESIGN: Since we didn’t know the exact shade of purple, we went with various shades from lavender to eggplant. 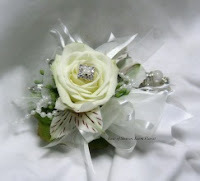 Classic white spray roses and fun accessories like the iridescent leaves and rhinestone picks finished the design. 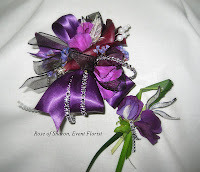 DESIGN: The young lady that ordered this corsage liked the various shades of deep purple, but wanted a different flower, so we used the same ribbons and accessories, but featured a purple tinted mum. DESIGN: The original photo shows sweet peas. I didn’t have any this year, so we used Alstroemeria lilies. We tried to keep everything else the same, including the dark purple ribbons and silver and rhinestone accents. DESIGN: We didn’t design the corsage for this couple, just the boutonniere. To match her dress, she picked the deep purple calla lily, but left everything else up to us. I love the clean look of the Calla Lily and silver gleaming leaves. DESIGN: This is my personal favorite. This young man came in two years in a row. Last year, he ordered red spray roses. This year, his date (same girl) was wearing purple. So we went with the fuchsia Dendrobium orchids. He also picked a rhinestone bracelet and the silver accessories. Almost everything in this design was chosen by the guy. How’d he do? Of course, since we designed for them last year, we knew the style they liked, which is always a benefit.
. There aren’t many blue flowers and no true turquoise flowers—at least not that I’ve worked with. So we often use white flowers and turquoise accessories. Again, the challenge is making sure everything looks different. We can’t have two girls wearing the same corsage at the same prom! DESIGN: This is a composite flower consisting of a spray rose and Alstroemeria petals. The Flutterzz feather accents were very popular this year. They are a great way to add movement and length without adding a lot of weight. And they come in so many great colors-including turquoise! REQUEST: ’My daughter needs a fun design for a turquoise dress. DESIGN: When the girl’s mother ordered this set, she started with the zebra print ribbon, then she picked out the accessories, including white Flutterzz and rhinestones. DESIGN: We used the royal blue Flutterzz, light blue ribbons, blue rhinestone accessories. This is one of the few corsages where the customer requested fresh foliage. DESIGN: With ‘pearls and shimmer’ in mind, we picked a glittery blue ribbon, a turquoise accent ribbon, iridescent leaves and pearls…and not a single rhinestone. 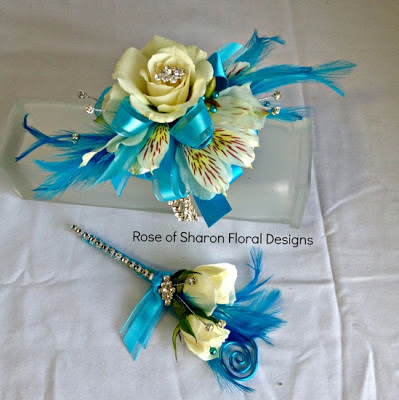 I have been a floral designer for 18 years and owned the Rose of Sharon Floral Designs for 15 years. The Rose of Sharon is located in the northwest corner of Arkansas, and recently moved to a larger space just north of Fayetteville, AR. I've always loved the detail work needed for weddings and proms; it is one of the main things that drew me to being a florist.